In much of Arizona, desert tortoises should be kept outdoors year round. As cool fall weather returns, your tortoise’s appetite will decrease and it will become less active as it prepares to hibernate in its shelter. It will have a fat reserve built up and should easily survive through the winter hibernation using its shelter if it has eaten well during the warm months. A health check-up with a reptile veterinarian is recommended to ensure your tortoise is healthy enough to hibernate. If the tortoise does not move into its shelter by the time nightly temperatures dip below 50 degrees or you are not sure whether the shelter will remain dry during winter rains, you will need to hibernate it in a cool, dark area of your garage or other room. 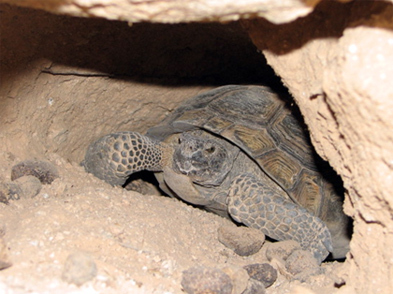 If you live outside of natural range of the desert tortoise (such as Prescott), the tortoise will need to be hibernated in cool dark area inside your home (such as a garage) that, ideally, does not go below 50 degrees. A heavy cardboard box, non-transparent plastic storage container or portable tortoise house packed with shredded paper or straw generally provides adequate protection. The box should be covered with several layers of blankets or newspapers, and kept up off the floor away from any holes that could lead to drafts or rodent invasion. The tortoise will not achieve metabolic hibernation if its shelter is too warm. Dehydration is a significant risk during indoor hibernation, but is generally avoided if the humidity is maintained between 30-40 percent. This can be monitored using an inexpensive thermometer and humidity meter. Juveniles should be offered water every 2-3 weeks and adults every 4-6 weeks during hibernation. Otherwise, do not expose the tortoise to light or other disturbances. What if the tortoise won’t hibernate? If your tortoise does not hibernate naturally, it may be sick and should be taken to a veterinarian. Do not allow a sick tortoise to hibernate, as it may not survive the winter. If the tortoise cannot hibernate due to a health problem or inadequate weight, the tortoise should be kept in an enclosure indoors. Tortoises being housed indoors should be kept in at least an 18-inch-by18-inch space and hatchlings can be housed in a 8-inch-by-8-inch space. The enclosure should maintain a daytime temperature of between 85-90 degrees, but not lower than 70 degrees. Use an artificial light above the enclosure and a thermometer to monitor the temperature. Different wattages may be tried until the desired temperature is achieved, but use light that provides the adequate amount of UVB (ultraviolet B rays). Maintain a normal daily photoperiod by turning off the light at sunset. Leaving the light on at night may result in hyperthyroidism, a glandular disorder. An 11-hour daylight cycle, followed by a 13-hour night cycle is ideal. Provide food according to the summer feeding schedule or your veterinarian’s guidance and provide fresh water at least three times a week. Take the tortoise outside whenever the sun is shining and temperatures are above 70 degrees, but below 85 degrees. Frequent exposure to sunlight is beneficial to tortoises in rehabilitation and will usually stimulate their appetite. Shade must always be available. As spring approaches, a hibernating tortoise will become more active. When it emerges be sure to provide a shallow dish of drinking water. It will gradually resume its warm weather routine of eating, basking and exercise. Tortoises maintained in southern Arizona are usually active by April, but in particularly dry years, it may not emerge until the summer rains begin in July or August.